Notice:This is DIY product,according to renderings (or your own ideas), paste in your favorite place. Package Include: 1x DIY Mirror Wall Sticker Our decal stickers are made from the best acrylic in the industry. They can last for many years without peeling or fading. Our decal stickers are no harm to the environment and health. Installation prompt: 1.Please keep the wall clean before pasting. 2.First according to the template on the ground, put the product well. 3.Suggest to take a small piece of component test whether suitable for metope. 4.This product can be used again and again, please use another binding to cooperate when you use again. 5.Press firmly to squeeze out any air bubbles. Don't: Ash surface, Broken surface,uneven surface Do:Clean smooth wall,tiles,windows,smooth wallpaper,closets,plastic. 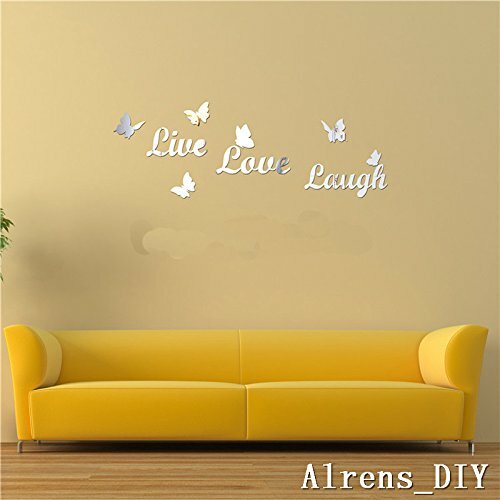 Notice:This is DIY product,according renderings (or your own ideas), paste in your favorite place. Package Include: 1 x mirror sticker Our decal stickers are made from the best acrylic in the industry. They can last for many years without peeling or fading. Our decal stickers are no harm to the environment and health. Installation prompt: 1. Please keep the wall clean before pasting. 2.First according to the template on the ground, put the product well. 3.Suggst to take a small piece of component test whether suitable for metope. 4.This product can be used again and again, please use another binding to cooperate when you use again. 5. Press firmly to squeeze out any air bubbles. Don't: Ash surface, Broken surface,uneven surface Do:Clean smooth wall,tiles,windows,smooth wallpaper,closets,plastic. Description: 100% Brand New. 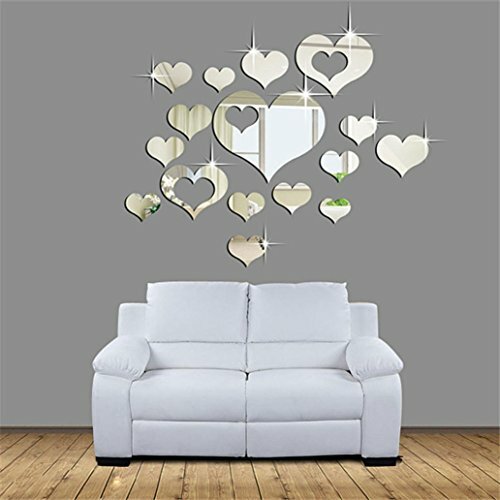 Material: Plastic Color: Silver Quantity: 15PCS Shape: Hearts Size Type:Multi-size Design: DIY Item: 3D Wall Stickers Opportunity: LivingRoom, Bedroom, Home Note: Due to the difference between different monitors, the picture may not reflect the actual color ofthe item. We guarantee the style is the same as shown in the pictures. Thank you! Package Content: 1 x 3D Wall StickersPictures for reference only, in kind prevail, this product is made of plastic products, but the mirror effect. In order to facilitate the safe delivery of this product, we will attach a layer of film to prevent scratches, guests do not have to worry, when you receive this product, you can tear that layer of film for normal use. 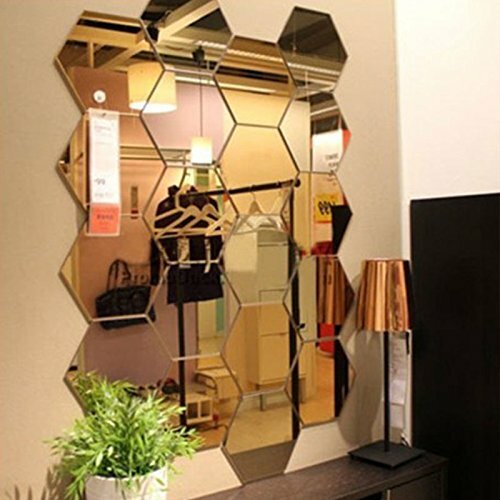 Hexagon mirror wall sticker is made from environmental acrylic. 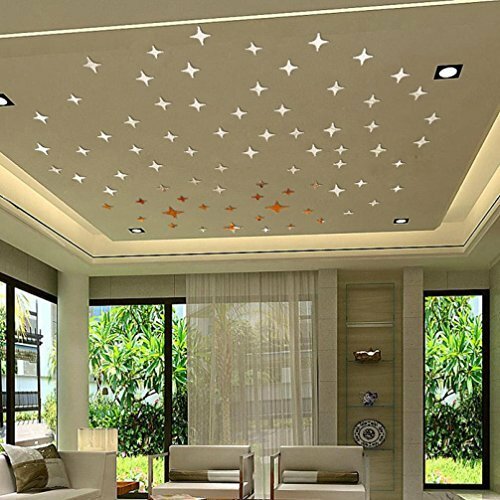 It is ideal to decorate different occasions like TV backdrop, sofa wall, window, door, closet, freezer, cabinet, tiles, nursery, bathroom, bedroom and office. Specifications: * Material: Acrylic. * Color: Silver. * Quantity: 12 pcs. * Size: The length of each side is 9 cm / 3.5'', diameter 18.3 cm / 7.2''. Package Include: * 12 pcs × hexagon mirror wall sticker. How to Use: * Please make sure your surface is very smooth & clean before applying. * Tearing off the back surface and stick it to wall directly. * The surface has a protective film and it can be removed. 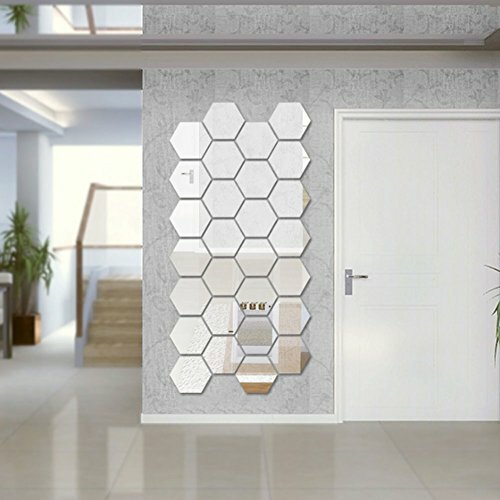 * The wall geometric mirror hexagon mirror sticker can be reused. 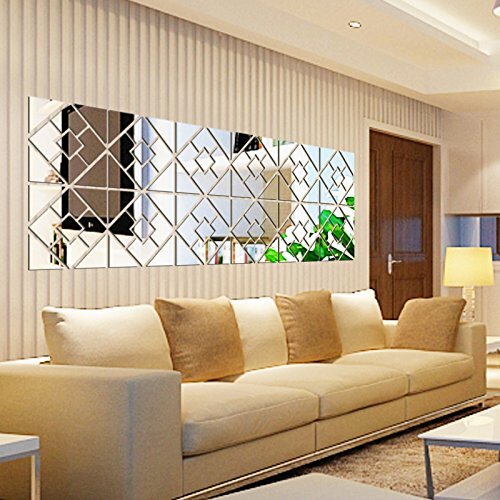 The wall decor mirror will make your room more beautiful. They can be fixed in any smooth surface, such as ceramic wall, glass, metal and more. They can be used for many years without peeling or fading. Our decal stickers do no harm to the environment and health. Specifications: Material: Acrylic Color: Silver Quantity: 36 PCS Package include:4 Sets(1set=9x Mirror Decors).Each Set Size:L*W/30x30CM/11.8''x11.8" Applications: Ideal for Bathroom, Dressing Room, Cabinet, Washroom, the back of doors and more. How to use: 1. Please make sure your surface is very smooth & clean before applying. 2. Tearing off the back surface and stick it to wall directly. 3. The surface has a protective film and it can be removed. 4. The wall mirror sticker can be reused. NOTE: There is a protective film to protect the surface. Please peel it off before using. 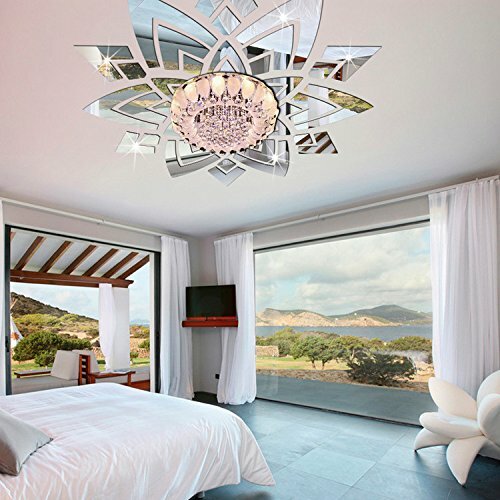 Watch our Mirror Wall Decal video and you'll be decorating with reflective decals in no time! 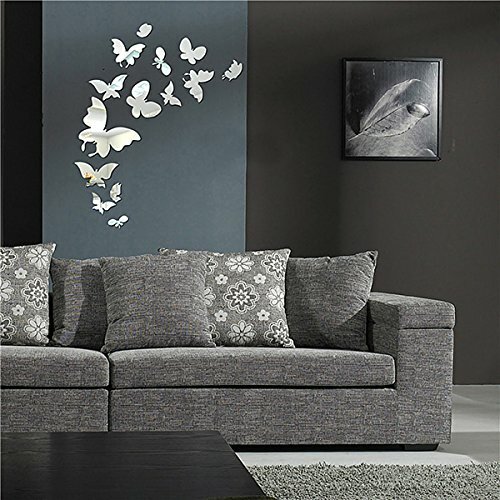 Find Mirror Wall Stickers at http://www.lot26.com/s/Adhesive-Wall-Mirrors. Model name bikrikendra hexagon model 3 d acrylic mirror wall decor sticker Size = 151cm No.of sticker = 13 Lamination type =gloss Self adhesive sticker Ideal for home ,lounge, cafe,restaurant etc Easy installation. Do,not apply on wet wall. Brought from filpkart. Thanks for watching. 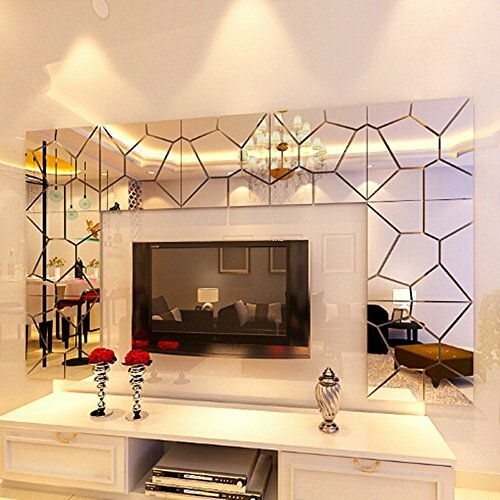 Compare prices on 3d Acrylic Mirror Wall Sticker at ShoppinGent.com – use promo codes and coupons for best offers and deals. Start smart buying with ShoppinGent.com right now and choose your golden price on every purchase.